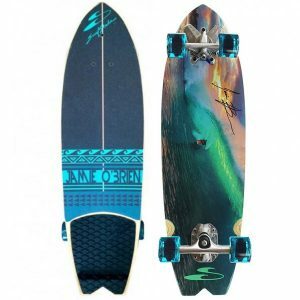 The Premiere Blue is a great carving deck due its length and width. The large deck and our longest wheelbase allows a rider’s feet to fit completely within the rails, providing stability and carving control. It looks like a surfboard, it rides like a surfboard. The premiere is the original surfskate. 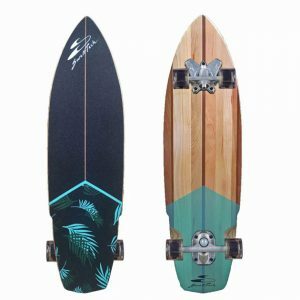 With its surfboard lines and feel, deck grip, stringer and colour coded logo it looks amazing and gives that true surfboard on land experience. With it’s swell tech truck, it’s the highest performing carving truck out there. 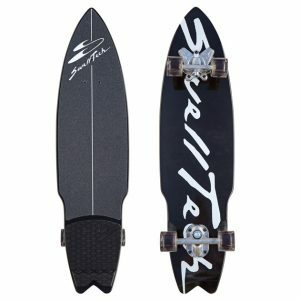 The unique 360 degree rotating front truck allows for full free motion of the front of the board while the back truck acts as your pivot point, just like the fins on a surfboard. Together these trucks allow a rider to use their upper body as they would surfing; pumping the board for speed, and leading with their shoulders to perform carving turns and cutbacks. The Premiere Blue is a great carving deck due its length and width, now with an increased wheelbase for 2017. The large deck allows a rider’s feet to fit completely within the rails, providing stability and carving control. Could be recommended for downhill, carving, or if you are a taller rider, but can still hold its own at the skatepark.